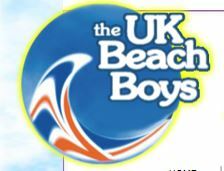 The UK Beach Boys are Ian Baker, Dacre Peck, Ben Whiston and Paul Johnson all talented musicians who all have an interest in The Beach Boys and their music. The band are currently available throughout the UK and Europe. The UK Beach Boys were rehearsed under the watchful eye of Adrian Baker, who was a member of The Beach Boys for several years, recorded albums with Mike Love and was touring with them until April 2004. Adrian was in the UK in the new year of 2002 giving advice to their UK counterparts to ensure a sound as authentic as possible. Feel free to browse this site where you will find any information you are looking for regarding dates, contacts and downloadable samples. If you can’t find what you are looking for please contact us. The band has now established itself as one of the UK’s top tributes and featured at leading festivals, theatres and for many satisfied clients at prestigious “blue-chip” corporate events. Demand has increased since the release of their “live” CD and the resurgence of the popularity of Brian Wilson with the release of “SMILE” in 2004. 2004 also saw the launch of their new THEATRE SHOW, “KEEPING THE SUMMER ALIVE” which has been playing to theatre audiences throughout the UK to excellent reviews. The UK BEACH BOYS were also privileged to be invited to join The Beach Boys on stage at Thetford during their brief visit to the UK in the summer of 2003. If you would like to know if we are appearing near you, contact us and we will be pleased to advise. The band are self managed and self contained and have a huge amount of experience in all types of venues from hotels to theatres. They are available in the UK and Internationally for venues suitable for a truly professional show, with excellent credentials from the very best clients.